Volkswagen yesterday revealed a stunning new concept car, named XL Sport, on the eve of the Paris Motor Show. The gullwing-door two-seater model is based on – and closely resembles – Volkswagen's advanced new eco-car, the XL1. However, where that car uses a tiny 0.8-litre diesel engine mated to an electric motor for incredible 313mpg fuel economy, the XL Sport uses a decidedly more potent V-twin petrol motor, supplied by Italian motorcycle marque Ducati. The engine is normally found in the company's fastest superbikes, where its 197bhp is more than sufficient for bowel-loosening speeds. While most hot hatchbacks now develop in excess of 230bhp, the Ducati engine is enough to endow the XL1 with sports car levels of performance thanks to its low weight and aerodynamic shape. VW claims it will cover the 0-62mph sprint in 5.7 seconds, and romp on to a top speed of 167mph – impressive stuff in anyone's books. The engine is mated to VW's seven-speed DSG automatic gearbox, which also incorporates a reduction gear to boost torque and make the car more driveable. The XL Sport also features a wider body than the standard XL1, housing a wider track and a chassis tweaked for improved dynamics. The interior has been subtly uplifted, too, and now has a motorsport derived digital instrument cluster, aluminium gear-shift paddles on the steering wheel and contrasting red stitching on the seats. 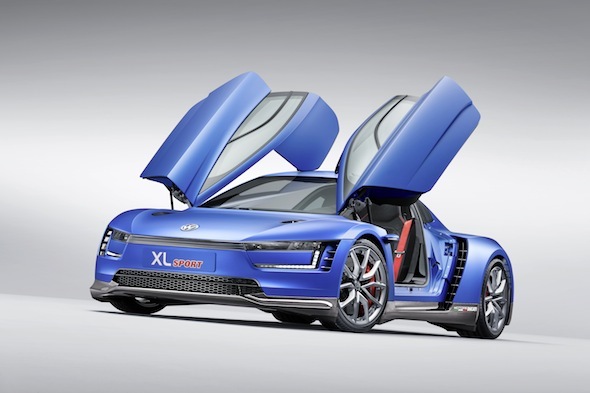 Unfortunately, VW has no plans to put the XL Sport into production, stating it was merely an exercise in mixing car and motorbike technology. Given the way it looks, we'd imagine they might change their minds once a few wealthy petrolheads get their cheque books out at the Paris show stand. The XL Sport marks a significant milestone for the German auto giant, which claims it is the 200 millionth car to roll of the production line since VW was founded in 1937.